This following essay is written by anarchist prisoner, Sean Swain, and was originally released on the Final Straw Radio show. For more info about how to support Sean, go here. In Ohio prisons, pretty much everyone is in a gang whether they’re in a gang or not. If you’re an Ohio prisoner and you’re not in a gang, prison administrators will put you in one. And if there’s no gang for you, they’ll just create a new one. The U.S. Department of Justice keeps a kind of database on what it calls “Security Threat Groups,” or STGs, not to be confused with STDs, or “sexually transmitted diseases.” The Department of Justice does not monitor chlamydia or gonorrhea. Yet. At least, as far as I know. On September 9th, prisoners across the United States will begin a strike that will be a general work stoppage against prison slavery. In short, prisoners will refuse to work; they will refuse to keep the prisons running by their own labors. Prisoners are striking not just for better conditions or changes in parole rules, but against prison slavery. Prisoners state that under the 13th Amendment which abolished racial slavery, at the same time it allowed human beings to be worked for free or next to nothing as long as they were prisoners. Prisoners see the current system of prison slavery to thus be a continuation of racial slavery, which is a system that generates billions of dollars in profits each year for major corporations in key industries such as fossil fuels, fast food, banking, and the US military. Warren Correctional Institution, not content with merely restricting Sean’s communications with the outside world, has now assigned a lieutenant to read through all printed materials sent to Sean. Please take a minute to send Sean some reading material. That stack of zines in the bathroom? That one book you’ve had for years but will never read? All those fancy new publications you designed? Send them all! Let’s help Sean (and the fuckweasels who intercept his mail) something to pass the time. 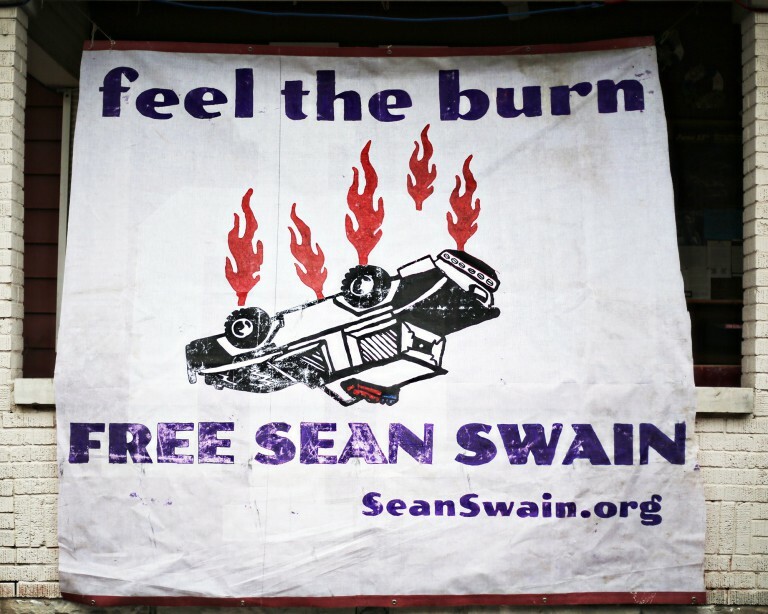 We hung a banner in solidarity with Sean Swain’s struggles against the prison system in Ohio. Despite repeatedly being transferred and having his communications cut off, Sean remains uncompromising in his pursuit of freedom, putting his life on the line in struggle against the state. We keep his words and deeds with us as we carry out our own struggles against prison society. Fundraising, letters, demonstrations, banners, graffiti, and direct attacks form a bright tapestry of revolutionary solidarity. Let’s always be searching for new ways to break down the isolation of imprisonment and build complicity through the prison walls. Black December is coming, and none too soon. We’ve hashed out our theories and we’ve analyzed our reality, we know what kind of future we want and what we are going to have to tear apart in order to get it. The time for philosophizing and talking it out has ended and we face the inevitable moment of conflict with the forces of control and conformity and subjugation. December really is the perfect starting point, here in the U.S. anyway. It’s the darkest month of the year, the most non-daylight hours to carry our acts of resistance and rebellion. Also, in the cold, everyone wears ski masks. So, a rebel about to strike a Walmart or a police car or some fascist administrator’s house doesn’t look quite as conspicuous as he or she might look in, say, July or August in the same gear. Sean Swain is having a very hard time right now and could really use being reminded that he is not alone. If you haven’t written to Sean in a while or haven’t heard back from him due to the ODRC messing with his mail or cutting off his other methods of communication, now would be a great time to flood him with letters, cards, photos, drawings, books, zines, anything. In particular, now would be a good moment to remind Sean that he matters to you, that you are glad he is alive, and that you see him as contributing to the world in a way that matters to you. Every once in a while we all need a loving kick to the head to get us back on track and feeling ready to continue fighting. Now is that moment for Sean. So send him a kick; he deserves it. We’re excited to announce the first issue of Wildfire, a new quarterly newsletter of anarchist prison struggle. We have two goals with this project: to spread the words and actions of anarchist prisoners in the United States and to offer news and updates on anti-authoritarian struggle for comrades in prison who might not otherwise have access to this information. With fascist fuckweasels ignoring his hungerstrike, anarchist prisoner Sean Swain has vowed to refuse his blood pressure medication, beginning February 9. This medication keeps his blood pressure regulated. To stop taking this medication “cold turkey” is extremely dangerous, as it could cause a spike in blood pressure which can lead to heart attack, stroke or aneurysm. 32 page issue of Dark Nights covers two months prisoner’s letters and extended direct action chronology (always incomplete), all translations via the international network of informal counter-info! Back in May 2012, Roberto Adinolfi managed Ansaldo Nucleare, constructing nuclear power plants all over Europe, including the one in Kroko, Slovenia, and Cernadova, Romania. Adinolfi had power, money, prestige, and influence. To him, the suffering and death in Fukushima, Japan wasn’t nearly as real as his spacious, air-conditioned office or his luxurious Genoa home or his expensive suits. Sometimes, you have to crack a few eggs to make an omelet. And besides, none of his death-traps had melted down yet.